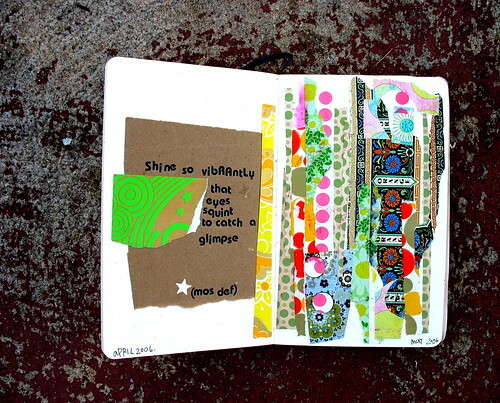 moleskine page, originally uploaded by girlhula. –To love and forgive someone even though your encounters with them has caused you pain does nothing for them and everything for you. Remember, what you give comes back. We forgive for our own evolution, not for the benefit of the other person. –Understanding or accepting other people is difficult because we have not been taught to accept ourselves. As we see it, there is always something to fix, change or do to make others the way we want them to be and ourselves better than we are now. We find the weak spots… and we pick, pick, pick rather than nurturing, strengthening, and allowing time to grow. -If you make anyone or anything responsible for your happiness, you will never be happy. If you make anyone or anything responsible for what you do or do not do, you will not accomplish much. No one is responsible for you but you. -Death, I thought to myself, is simple. Stop breathing. Stop living. Very often when we create drama in our lives, we stop breathing. We stop thinking. Our hands become cold. Our senses are dulled. Our mouth becomes dry. It’s called stress. -Bad family blood means that you do your best to keep the peace even when it means sitting around people, acting like you are comfortable when you are miserable. -Maya Angelou described how words stick to the walls, the furniture, the curtains, and our clothing. She believes the words in our environment seep into our being and become a part of who we are. -How many people have you been there for, only to find yourself alone when you need someone? In how many relationships have you given your all only to be left hanging out to dry with your broken heart on your tear-stained sleeve? What you give to others you give to yourself. Translation: If you appreciate what you do for others, their response should be of little consequence to you. -Wherever you find yourself is exactly where you need to be. Even when you want to be somewhere else, under different circumstances, life knows that you probably could not handle it. Deepak Chopra wrote, ”Whatever relationships you have attracted into life at any given time, are the relationships you need to be in at that time.” When you are ready to do a new thing, in a new way, you will do it, with new people. This entry was posted on Monday, January 28th, 2008 at 7:18 pm	and tagged with change, forgive, healing, iyanla vanzant, mindfulness, positive, self help, surrender and posted in thoughts. You can follow any responses to this entry through the RSS 2.0 feed. thanks for sharing…..loved reading through all of that.